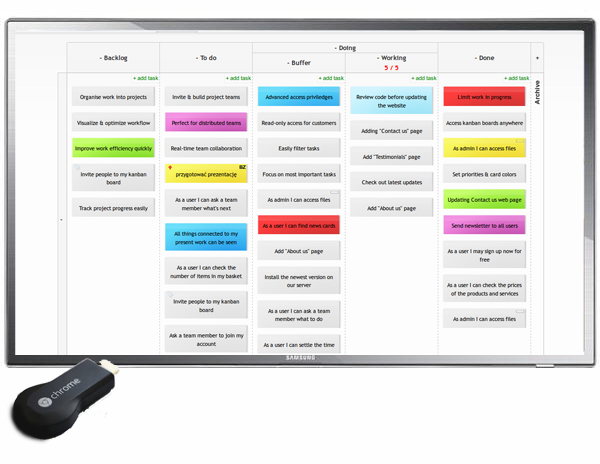 Today we are happy to introduce Kanban Cast - Kanban Tool's take on Chromecast. This will enable all Chromecast owners to create an insightful information radiator, based on a Kanban board. 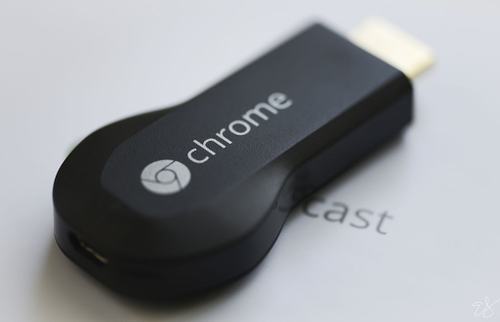 Chromecast is the name of a streaming device, that works when plugged into a tv's HDMI port. It will mirror the screen of the particular device that it was plugged into. Therefore - if you plug it into a tv and to your computer (although it can be most modern devices that use Chrome) - you'll be able to create - from your Kanban Tool - a perfect information radiator. The reason that it makes a great impact, is that Kanban is mainly used by teams, that need to communicate effectively. To allow a swift information flow and reduce time spent on meetings and establishing common versions of a particular problem - just place an information radiator in a well-seen spot, so that everyone on the team can see the state of things at a glance. The two main characteristics of a succesful information radiator are - the necessity for the information to change and adjust to current workflow, and the need for it to be very easily understood. Ideally, people should get the gist of the info just by glancing at it when walking by. This - combined with the idea of Kanban (visualize workflow and limit WIP) - makes the ultimate Kanban Radiator. Now, what is left for you to do is, provided that you have a Chromecast, switch it on in Kanban Tool board view (right next to the tools+ section). Of course, you need to have the Chrome browser installed, together with the Google Cast extension. Make sure that your big screen is in a place visually accessible to all team members - on a wall, at which everyone can glance or a spot by a frequented doorway. 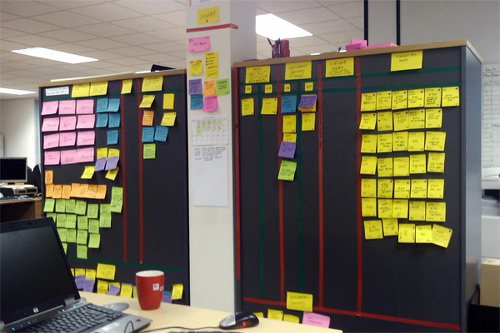 The application of Kanban Cast makes for great communication and efficiency within the team. Team members know a great deal of their work-mates' tasks, henceforth have a better idea of the big picture that they all contribute to. Also finding potential problems and problem-solvers is much easier, when all the goings-on are transparent to the whole team. Switch on your Kanban Cast and start radiating the workflow onto your team with Kanban Tool today.